It was a blistering day, with limpid sea, and we went on a veritable nature trail on our swim from the mouth of the Yealm to Cellars Beach. We scrambled down from the coastpath, boiling in our wetsuits, to Greylake Cove where turquoise lagoons beckoned. In the first pool we saw a spider crab; this is the time of year they come inshore to breed. As we swam in and out of the lagoons along the coast we saw many different types of fish, from tiny silver ones in massive shoals, to what looked like wrasse; brown, pink and blue ones. There were more spider crabs, and the seaweed was simply beautiful, with rays of sun glittering through it. We swam through forests of the stuff, letting it caress our faces. It felt like snuggling up to a mermaid. After of weeks of incessant rain we suddenly have a heatwave. Lynne, Geoffrey and I set off towards the sea at Goodrington beach in Paignton, enjoying the feel of the warm red sand in between our toes, to swim the mile south to Broadsands. We soon found ourselves over the most fascinating reef, and spent ages pootling around looking at the seaweed, anemones and shoals of tiny blue fish. We then swam on, sayi ng hello to an eccentric canoeist wearing nothing but a minuscule pair of trunks (him not us), past numerous little coves, before hitting Armchair Rock. 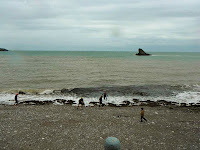 In the final part of the swim, in the approach to Broadsands, the water was lagoon-like, glossy like a swimming pool. As the Olympic Torch made its way through the West Country, the inspirational pink-robed Pauline thought we swimmers should make our own special contribution. Saturday 19th May, the first day of the relay, found us gathered on the Cornish side of the Tamar at Saltash. There was a party atmosphere complete with doughnut and burger vans. 39 swimmers set off through the buoys and boats. Out in the middle of the river, I stopped to look up at Brunel's stark and beautiful bridge; it felt like quite a historic moment. Then it was on to the Devon side, where we touched the bottom and stood for a rest and a cheer, before swimming back across to Cornwall. A great day. 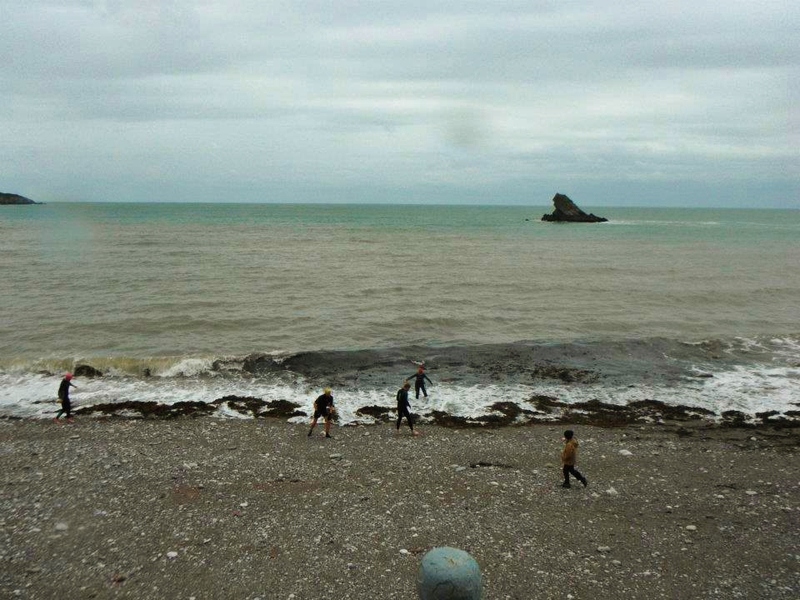 Matt, Rachel and I entered the water at Breakwater Beach in Brixham on one of the lowest tides for several months. Weird and wonderful rocks were revealed; the water was calm, perfect for exploring, but still milky looking, due to the rough seas we've had of late. We swam past architectural oddities; old steps that now go nowhere, seemingly redundant arches, and rows of sandbags squashed into the cliff. We arrived at glorious Shoalstone Pool, an art deco gem, and climbed up off the rocky outcrop on which it sits, scrambling, guerilla-style, over the railings. We found the pool empty, and bein g lovingly painted by Mark and Kevin, from the Friends of Shoalstone Pool. They told us it's all hands to the pump to try and get the pool ready; lots of people are rallying round, including the Berry Head coastguard team. They're even using trawler paint for some of the work, and are appealing for anyone who can help in any way to get in touch. In previous years the pool has been open by now, but the council says in 2012 it will only be open for the six weeks of the school holidays. North Easterly winds were blasting Torbay and so we switched the location of our swim to Meadfoot Beach, where the sea wasn't quite so rough. We found the perfect changing area under the beach huts, and met friendly beach manager Mike, who even fitted up the shower for us. We could see Shag Rock like a shark's fin in the distance. We swam out through bouncing seas, swallowing rather too many mouthfuls of water on the way. Up close, th e rock is majestic, bearing down on you with its stark layers poised precariously at a 45 degree angle to the sea. We then swam on to West Shag Rock - like Shag Rock's kid brother - before swimming back past Triangle Point, which is again, another massive slab of angles. Afterwards we warmed up in the lovely cafe, clutching mugs of tea and scoffing sausage and chips.